Set a food budget so that you know how much you have to spend on the foods you need. Do some meal planning so that you know what’s for dinner and you aren’t tempted to buy fast food at the last minute. Write a grocery list so that you don’t make impulse purchases. Meal plan around the plate: make half the plate fruits and vegetables, one quarter of the plate whole grains, and the last quarter a lean protein. 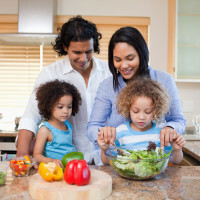 Check out meal time tips and choosemyplate.gov for healthy options. Lean proteins don’t always have to be meat: try a plant-based protein like beans, lentils, or soy. Pick an inexpensive “go-to meal” that you enjoy once a week –like tacos with veggies and lean ground turkey with salsa, bean-veggie enchiladas or a colorful southwestern bean salad. Kids often beg for treats – choose a healthy snack before you go! Then let them choose foods from the produce aisle, not the candy aisle. Pack snacks for the family. Foods from snack bars or convenience stores can cost lots of money over time.